Does your wardrobe need a little heart? In last week’s post, I demonstrated how to make hearty home decor accents that could be used as: woolerfully festive seasonal garlands… wraps for around dinner napkins/candles and special occasion decor… adornment for your book lovin’ shelves or whatever item/space you love! Begin by downloading my Sweetie♥KNIT♥Heart FREE knitting pattern. Click HERE for the original post. 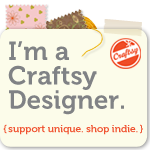 You can also view, follow and save my designs to your favourites via Ravelry and Craftsy. Next, knit the hearts from feltable wool and appropriately sized knitting needles. See “how to” PDF instructions (below) for felting the loopy straps. Be sure to leave extra-long tails and check for fit while felting, since the felting process causes wool fibres to shrink/matt and lose the ability to stretch. for felting two loopy bracelet straps (as pictured), or a single, thicker strap. Feel like felting more stuff? Here are a few other felting posts of mine. Sweetie♥KNIT♥Shamrocks . . . a free little knitting pattern that felts like Spring!